Numerous studies and many different credible sources, show that charismatic leaders outperform their non-charismatic peers by an average of 68%, (Harvard Business Review 2012). Nikki Owen has dedicated over 30 years to the study of authentic charisma. Her own research into the link between authentic charisma and engagement with 150 business leaders which revealed that authentic charisma increased a leader’s ability to engage by an average of 19%. Full Potential Group have worked collaboratively with Owen’s methodology to create a high impact leadership development coaching solution. But what is authentic charisma? “Charisma is an authentic power that captivates the hearts and minds of others.” Regardless of whether a leader is introverted or extroverted the vital component to charisma is the ability to be totally authentic. You can’t teach authentic charisma using a behavioural based approach, because if those 'pasted on' charismatic behaviours are out of alignment with the true authentic person they will appear superficial, fake and inauthentic. At this point the leader is accessing their highest performing state. This is when they become authentically charismatic. The Charisma Model shows that by developing self- esteem, sensory awareness, the individual’s vision and their driving force, the leader’s energy builds a growth mindset. This reduces their protective walls, often shown as resistance and disengagement. Immediately the individual elevates their performance. This multi-level programme blends face-to-face charisma coaching sessions designed to work directly with the leader’s own charismatic potential. They are equipped with ground-breaking tools and processes contained within a simple online pathway to ensure that there is learning transfer and practical ways to improve team performance. There is a mini 360 team survey used to demonstrate the impact gained from this programme across 18 KPIs that show ROI. The leader can also assess the transformation within their own mindset by completing a charisma perception tool. Cellular level – transforms cellular function from survival to growth. Unconscious level – transforms beliefs by changing negative programming into empowering programming that supports the leader’s success. Emotional level – develops a stronger connection with the ‘felt’ sense so that the leader becomes more heart centric and self-aware. 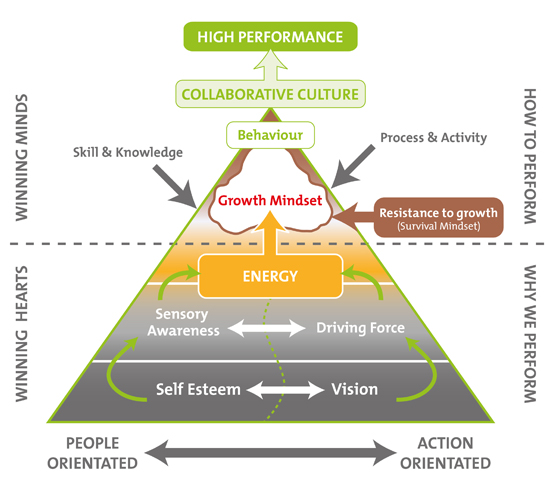 Behavioural level – because of the transformation at the above three levels this changes behaviours into those that inspire high performance in self and others. Easier to manage integration of three different cultures. What’s covered in the Authentic Charisma Coaching Programme? Session 1 – Definition of charisma. The Communication Process and the importance of developing the ‘felt’ sense. Guiding Principles to accelerate the development of authentic charisma. Exploration of leader’s own perceptions around their charismatic potential. Checking alignment of authentic charisma. Session 2 – The impact of energy on authenticity, engagement and charisma. Exploration of the factors that will a) build energy levels and b) drain energy levels. Introduction to a unique way to monitor energy. Experiment that demonstrates the impact of perception on motivation, engagement and performance. Session 3 – Introduction to cellular biology and why the cellular function impacts upon performance. Exploration into survival or growth operating mechanism with process to enable employees to move into a high performing growth mindset. Session 4 – Introduction to The Charisma Model and how it links to the Charisma Perception Process completed during the first session. Constellation process to sense and feel each of the five internal attributes that determine charisma. Identification and releasing of blockages that prevent charisma from flowing. What’s included within the Authentic Charisma Coaching Programme? 4 x 90 minutes of one-to-one coaching with accredited charisma coach – can be delivered face-to-face, online or a blend of both. Access to an online pathway to ensure immediate integration into the work environment. Coaching support and mentoring through the pathway. 360 team feedback surveys to measure behavioural change and ROI. Charisma Perception Tool to measure authenticity and self-awareness. Informal learning resources developed by Nikki Owen. Copy of Charismatic to the Core book. What’s different about the Authentic Charisma Coaching approach? It works mainly with the unconscious mind to ensure depth of transformation. Many of the psychological programmes that we run as adults are formed in childhood and are no longer helpful or actively sabotage our performance. We can resolve these limitations by becoming more aware of how to work in collaboration with the unconscious mind. It encourages the coachee to operate from their ‘felt’ sense rather than their thinking mode. Every emotion held within the body contains a message – a raisin d’etre for being. Noticing where we are holding emotions in the body enables us to gather useful information. You can’t ‘think’ your way around your body – you have to feel and for many people this requires them to switch into a different sensory operating mechanism. It involves working with an individual’s energetic field. A continual demonstration of the impact that thoughts, perceptions, beliefs and judgements have on energy. Naturally promotes mindfulness and an expanded awareness. Why me? I am a self-confessed ‘learning junkie’ and have been investing in my own development for many years. Each year I undertake a new accreditation to continually update my knowledge and the value I can give to my clients. I work with individuals and teams enabling them to connect with their core value, unlock more of their true potential and achieve greater success in their business and life. I help you to become more significant and to stand out for all the right reasons. I am a experienced trainer/workshop facilitator qualified Business and Personal Coach, a Professional speaker and a very active committee member of the Professional Speaking Association. I am a Global Partner with Talent Dynamics offering in-depth profiling to individuals and teams to identify your core strengths and how to play to those strengths to be in ‘flow’. I train and accredit other coaches and trainers to use this valuable business development pathway with their clients. I am an accredited Authentic Charisma Coach and work with senior leaders, developing their innate charisma and their understanding of the impact of their energy on the people they work with. This programme is changing the future of leadership and engagement. I have trained in the ‘Time to Think’ model of coaching created by Nancy Kline which is having a major impact on many of my clients. I am also a Harmonizing Alignment Consultant which is a transformational process connecting us to life's natural rhythms and how to work with the fluctuating needs of our body, mind and spirit. I have worked with over 1,000 people in the last 11 years and I get a great buzz from enabling people to realise and step into their unique power and unlock more of their true potential.